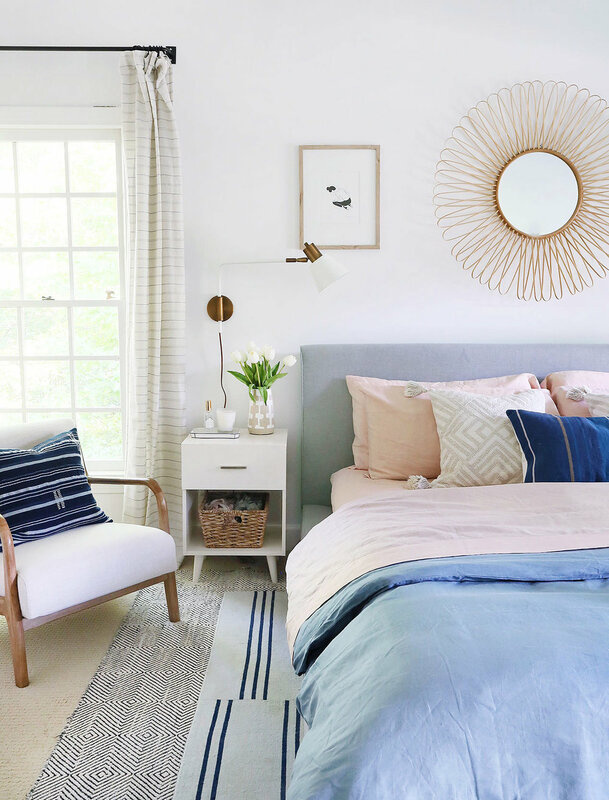 To be quite honest, my bedroom has always been a challenge for me to style. It used to be painted a blue-ish grey (which in looking back I actually really liked) and I painted it a crisp and clean white earlier this year. I looove the way white interiors look in other's spaces and I wanted to try it out myself, but I have struggled! The room checks all the boxes: lots of natural light, big and open with lots of windows, but so far all the things I have tried have left the room feeling a bit flat and soulless. I think the obvious solution staring me in my face was color! 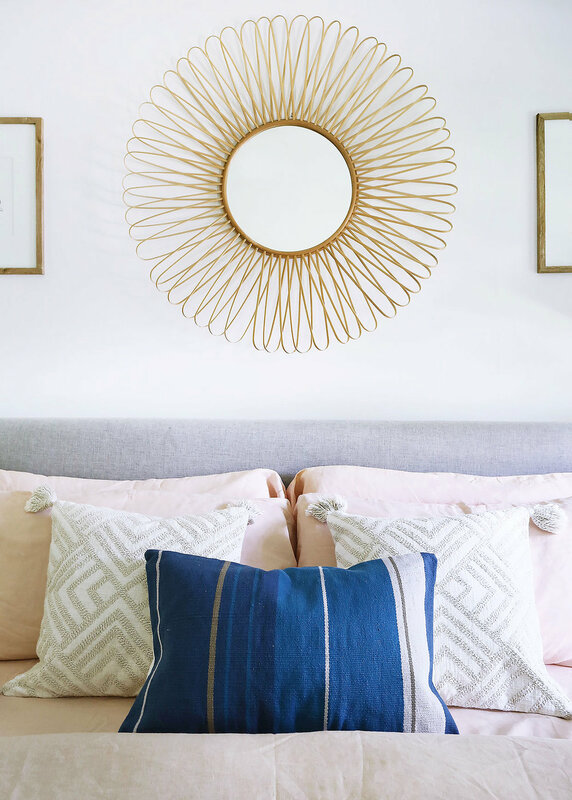 When The Company Store reached out for a potential styling opportunity with all their gorgeous bedding, I knew it was a perfect opportunity to add some much-needed color back into the room. I chose to dress the bed entirely in their Comfort Wash Linen (in Mineral Blue and Creamsicle) as its one of my favorite materials. I love the subtle texture and how light and airy it is. 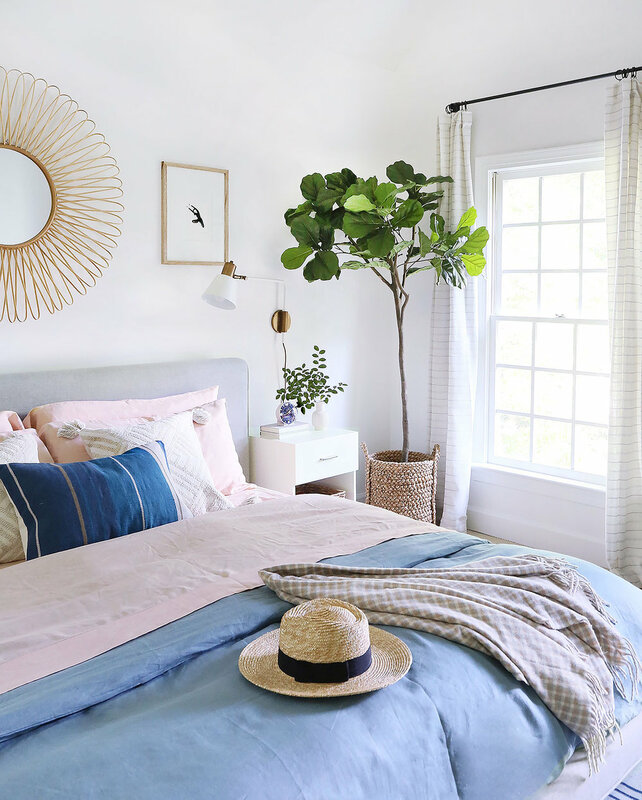 We run hot when we sleep, so linen is a literal dream for us! Another bonus to linen is how casual yet up-scale it feels and it gets softer after every wash.
How good is that pillow combination?! 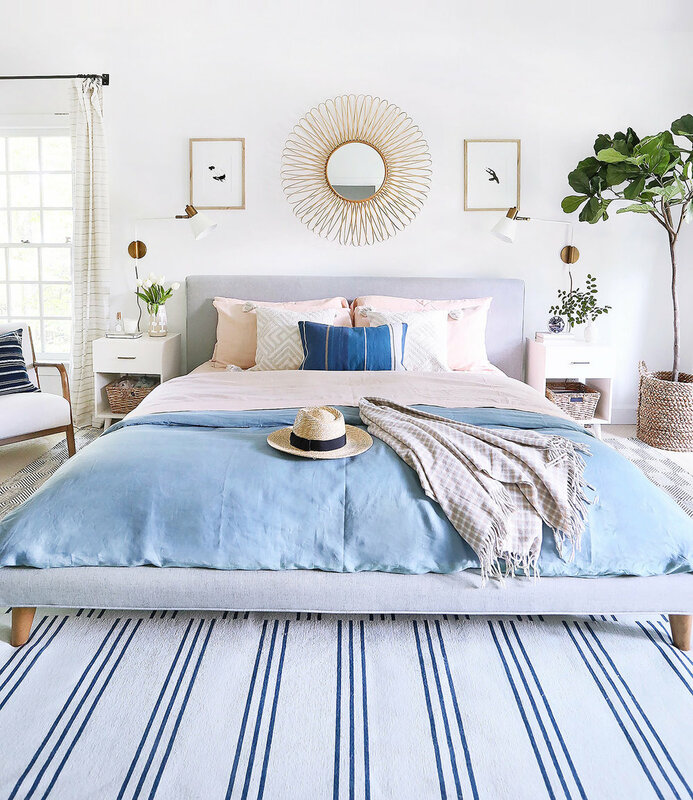 The bold pop from the blue stripes mixed with texture and tassels in the geometric cream pillows. One can never have enough throw pillows in their collection! I had to add a bit of plaid to the mix and I love the combination of the cozy wool from the throw (that is washable!) with the cool linen. I'm loving the pastel vibe that is happening in here now and how things are feeling a bit more interesting and full of life. Color will do that! I think I'll always return to blue when in doubt! This post is sponsored by The Company Store. All thoughts and opinions are my own. Thank you for supporting content that keeps Sunny Circle Studio going!